The use of our 18 x 50 m FLOODLIT SAND SCHOOL is available to all our liveried horses, as well as our 15m diameter ROUND PEN. We have a 16m diameter HORSE WALKER with pea gravel base. It takes 6 horses allowing plenty of space between each horse and as large a circle as possible so the horse is not walking ´shoulder-in´ as with smaller walkers. The climate here on the Costa del Sol means your equine friend will benefit from TURNOUT almost every day in our secure paddocks with fresh constant water and shade. Full livery includes ad-lib forage, along with regular daily stall cleaning. Paddock livery in our over-sized paddocks, also includes ad-lib hay (That means 24/7 your horse will be ´grazing´ - on the Costa del Sol real grazing is not a possibility). Natural and man-made shelters, constant fresh water and secure safe fencing complete our fabulous large paddocks, which are also regularly cleaned. Our short feed is a quality balanced, non-cereal based mix containing all the vitamins and minerals necessary to maintain a healthy working or breeding horse. It has been especially designed by us, and approved and manufactured by one of the leading registered Spanish feed companies, dedicated to quality horse feeds only. The feed is packed in modified atmosphere sacks, assuring the last is as fresh as the first. We can proudly state there has never been an incidence of colic at our yard. 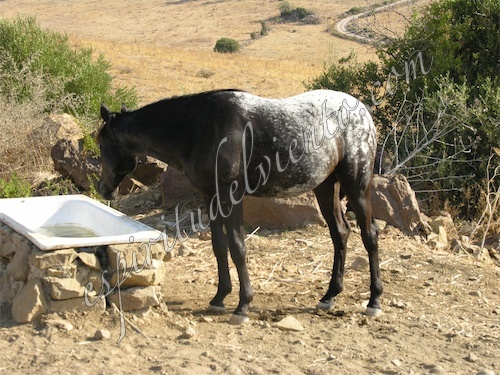 Horse permitted to live as near to their natural habitat as modern lives permit, means they are not stressed, they perform better, enjoy better relationships with their rider, and are healthier. Rather than worm unnecessarily, we perform regular counts on our horses and expect our clients to keep their horses inline with ours should a worm cycle be necessary. All horses must be vaccinated against Tetanus, and hold civil responsibility insurance.